I think we are destined not to see the Réserve Naturelle du Pinail [Pinail Trail] at its best. We dropped in for our inaugural visit last year and, though we weren’t too disappointed – it produced our first ever Green-eyed Hooktail (Onychogomphus forcipatus) – it was suffering from a desperately dry spring and he weather during our stay wasn’t settled. Though we think we scared up two of its most celebrated inhabitants and gave chase, we failed to snag them on pixels. Following a very interesting and successful day out with my new Odo-spotting friend yesterday, we thought we drive the 60kms/40mls or so over to the Pinail today to try again. The morning was warming up quite nicely as we left but, as we approached the area, the skies in the direction of the Pinail looked decidedly unsettled. Drat! We pressed on regardless, bought bread for lunch in Bonneuil-Matours and arrived at the Pinail shortly after 11:00 AM. The weather was overcast but dry. It wasn’t really warm enough or sunny enough to galvanize Odos into frenetic activity, though. If you can find them, that can actually be an advantage ‘cos they are reticent to fly off. However, my visual acuity is like that of the T-Rex in Jurassic Park in that it seems to be based largely on movement – if the Odos ain’t movin’, I don’t see ‘em. We did spot several of the usual suspects, though, and began snapping as we were overtaken by an older gentleman in the company of his grandson who was clearly receiving complex lessons concerning both wildlife and its photography in French. We swapped places with the French pair a few times as we scoured the pools for our main quarry. Eventually we came to the pools where we think we’d seen them, and missed them, before. Francine went closer and muttered something containing the words, “quarry” and “not joking”, as she raised her camera. I joined her, spotted the quarry too and began clicking away from the very restricted position with gay abandon. Our French companions were close so, after we’d grabbed what we wanted, I shared the quarry with them and the young grandson moved in to try his luck. I was now a very happy camper. 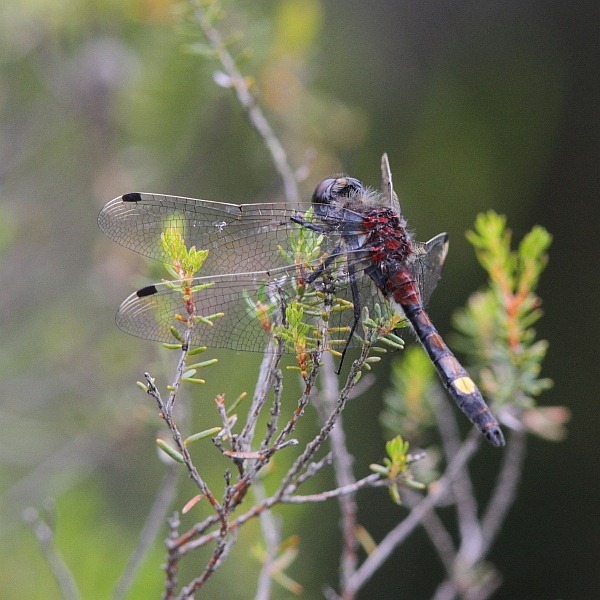 The Pinail is home to one of the more difficult to find dragonfly types, White-faced Darters (Leucorrhinia). What we’d found, and this time managed to snag on pixels, was a male Large White-faced Darter (Leucorrhinia pectoralis). Yes, I know, you can’t see its face – that’s the way round it was, though. You can, however, see very clearly the diagnostic large lemon-yellow spot on the dorsal side of abdominal segment 7 (S7). I’d have liked a full frontal, too, of course, but I was delighted with this. We continued round the trail, occasionally swapping information and nattering with our new French friends. 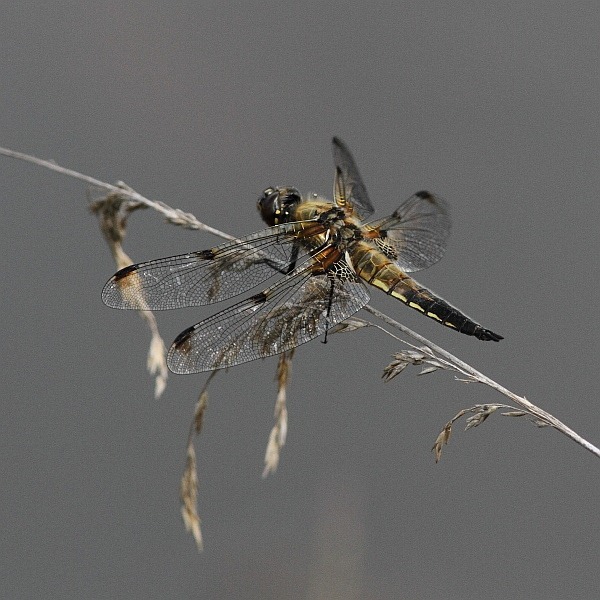 At one point the grandpère called us in to a pond where a Four-spotted Chaser (Libellula quadrimaculata) was perching and flying sorties. His well trained grandson moved as stealthily as he could struggling gamely with a very large camera, including battery pack, while I used my height advantage to shoot over his head. We both retired happy to the car park for a late lunch, I think, where grandpère shared another couple of useful locations with us. That’s for another year, though.